Clever, determined thieves can outwit nearly any security system. But crooks nearly always opt for the path of least resistance. What does that mean? If your home is unprotected, it looks like easy pickings compared to your neighbors’ well-secured home. There are many ways to stop, or at least slow, a burglar. Use several methods in conjunction for greater protection. 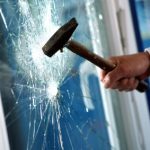 Window film: Thieves often enter a home by breaking a window. Security film makes it difficult to break glass. It protects windows from burglars, stray baseballs and high winds. Armorcoat, a clear security film, is applied directly to windows. It’s the brand used in federal buildings and military bases across the country. Security film prevents smash-and-grab thefts. If glass does break, the film remains intact, preventing shards from flying and further slowing bad guys. Home-security system: Home-security companies charge a one-time installation fee. After the system is installed, the company monitors a residence whether you’re at home or away. These systems may include checking for smoke, fire and carbon monoxide poisoning. If an alarm is triggered, the company will call the police or fire department. Be sure to post signs announcing your home is protected by a security system. The sign alone may keep burglars from targeting you. Wireless cameras: If you’re not ready to sign on with a monitoring service, you can still keep an eye, albeit a remote one, on your home. DIY security systems are easier to set up than ever. They work with your wi-fi, your home computer, tablet or smartphone. Once you install networked wireless cameras, you can login to check on your home from work or anywhere else. If something looks fishy, call the police. You’ll also have video evidence showing the intruders and their activities. Motion activated lights: Motion-activated lights are a good deterrent when placed around your property. This is an old technology, but it still works. Thieves like to work under a cloak of darkness. When they’re suddenly faced with the spotlight, many will scamper. A real or fake dog: Your pet may keep burglars away. Barking, or any other noise, sends thieves running. Most thieves don’t want to deal with a loud and possibly dangerous dog. Even small pooches with big barks have the power to scare off burglars. If you don’t have a dog, get a fake one. A motion-activated guard dog detects movement through the window. These electronic dogs start “barking” when they sniff out motion in your yard. There’s no sure thing when it comes to preventing a thief from breaking in. That doesn’t mean you shouldn’t try to thwart one. Take control by installing one or more of these safety systems. Contact Pacific Window Tint for a free estimate on security film for your home.